The fast popularity of the Soak-Off Gel Polish have brought the salons and technicians to an improper removal of the gel polish and leaving clients unsatisfied with their result. Improper removal of the gel polish becoming the biggest problem in the nail industry. 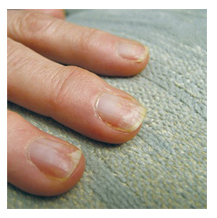 Incorrect removal is causing pits, cracks, and scrapes on client’s nail plate, often appearing as small white spots on the nails. And many nail technicians are failing to identify this as a problem. Gel Polish should come off easily with no heavy handed or forceful scraping. If you have to force the product off at all, you are doing something wrong. The most common reason why nail plates are injured during soak-off gel removal is because nail technicians do not let the product soak long enough to fully break the bond to the natural nail. Most of the time they’re not letting the nails soak for a long enough time, and when they go to remove the gel they pry or peel it off. When they do this, they take part of the natural nail plate off with the gel. 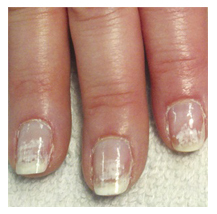 The result is a thin layer of the natural nail getting pulled up and causing divots and pockets in the natural nail bed. What’s even worse is that when the clients notice the damage and ask their nail technician about it, many technicians respond by saying that’s a natural part of the gel process and merely a dehydration of the nail plate from the acetone. Acetone does remove oils from the nail, but the nail plate itself is not damaged by acetone. The culprit here is the keratin layer in the nail enduring trauma when the gel polish is forced and pried off the nail. You can soak nails in acetone all day and you won’t see any white spots. Soak-off gel-polish is designed to soak off quickly and easily. But some nail techs cut the full soak-off time short because they think if they can remove the product quickly, even if resorting to a little force, then the nail is OK for another application and they’ve shaved some time off their total application procedure. If your client is wearing her gel-polish for a full 21 days or longer, she might need a little more time to soak to fully get the product off. Some gel-polish manufacturers advise that a soft tool like an orangewood stick be used to help gently push off the gel-polish after it has been soaked for an appropriate length of time, but that it should require little to no pressure at all to slough off the nail. Gel Polish is the best thing that’s happened to the nail industry in a long time!!! Soak Off Gel Polish takes excellent care of your customer’s nails.